NOTE ??? Additional shipping charges will apply to this bulky item for most delivery addresses. Once purchased a SCM staff member will be in touch to supply a quote based on your delivery address and the exact size of your purchase and also to confirm your wish to proceed. NOTE – Additional shipping charges will apply to this bulky item for most delivery addresses. Once purchased a SCM staff member will be in touch to supply a quote based on your delivery address and the exact size of your purchase and also to confirm your wish to proceed. The GIVI top cases and panniers are the result of more than 30 years' experience of careful attention to detail and caring for the needs of motorcyclists. The case opening/detaching system is operated with one hand only and the MONOKEY® and MONOLOCK® fitting systems guarantee ease of use together with a high reliability and durability that always characterise all GIVI products. MONOKEY® and MONOLOCK® cases boast a patented locking system that enables the opening/detaching of the case and its attaching/releasing from the plate with a single key. MONOKEY® cases are model specific and have a larger capacity than MONOLOCK® cases and are for use on motorcycles. MONOLOCK® cases are a generic fitment, have a smaller capacity and are usually used on scooters and maxiscooters. People passionate for adventure, riding for long distances, knows the importance of security,comfort and strength of the accessories. These concepts guided GIVI in the design of theTrekker Outback, the perfect side cases for people loving the off-road thrill and ready to face the hardest situations. 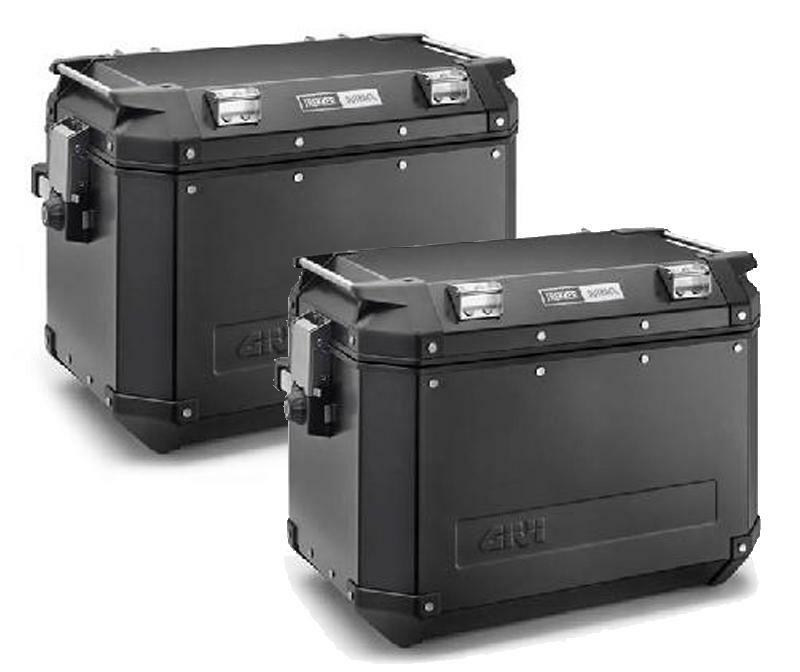 The Trekker Outback is Givi’s first squared case entirely made in aluminum and it is available in two models, 37 and 48 litres. This new model has all the characteristics to give you a great riding experience and a unique ease of use. It is characterized from a great resistance to shocks and stresses of extreme off road conditions, thanks to the aluminum structure and the brand new system Monokey-Cam side (Patent Pending), made especially for this innovative product. The Trekker Outback is an assurance of security and comfort: a unique key will operate the opening/closing system, even the coupling and release of it from the motorbike. The particular squared design offers a great loading capacity and, the chance of a complete detach of the upper cover makes this model essential for long travels. Trekker Outback is a product you cannot miss, it is absolutely essential for passionate motorbike adventures. Optional Brackets may need to be purchased to fit this item to your Motorcycle. Contact Us for the correct fitment to your application.